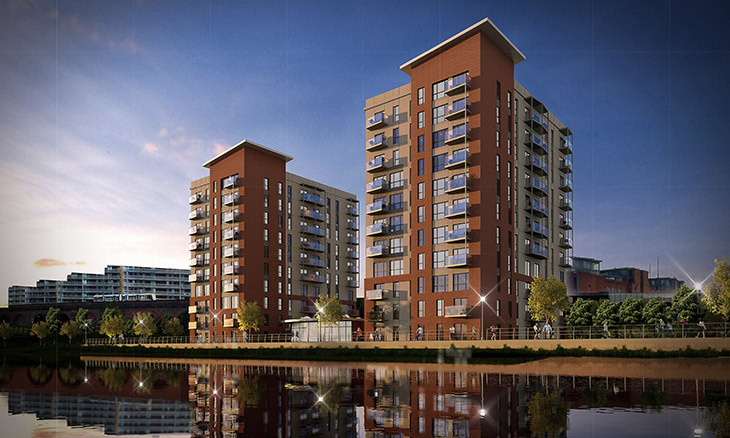 The Pomona Wharf development fronts onto the Manchester Ship Canal and is set back from the existing towpath which creates a public walkway and access to amenities on Pomona Island. It is a residential development of 164 apartments consisting of two buildings and link accommodation. One block of 11 storeys and 86 apartments and one block of 10 storeys and 78 apartments. The apartments contain a mix of 1, 2 and 3 bedroom self contained units serviced from a common stair and twin lifts. The scale and massing of the development reflects the surrounding area and increases the height from the adjacent St Georges Wharf to create an attractive frontage along Manchester Ship Canal. Car parking is hidden under the existing railway arches and landscaping to the area has been enhanced with planting of the waterfront and additional amenity space. Completed in November 2017 the construction was carried out by Rowlinson Ltd.